Well hello good people! Thanks for dropping past to check that all is well at Gidday HQ after the big birthday bonanza. 42 is going well so far – but it has taken me a week to get my proverbial s**t together to get tap-tap-tapping again. Who knew it would be such a busy week! Anyhow, with such a break between posts and a pretty full-on week, there’s lots to catch up on – picnicking at the polo, Kindle exploits (yes, I got one peeps – now just waiting for my free wireless router to be delivered) and Mad Men – but with the passing of August 1st, there is one update that demands my most urgent and immediate attention – My Year Of Baking. Just over a year ago, when navel-gazing about what I had achieved in my 41 years and what I might like to conquer in the year ahead, I decided to overcome my serious lack of baking experience. So I set up The Great Bake-Off tab on Gidday From The UK to chart my cake-and-cookie exploits. Just doing this was a triumph in itself as my excitement back on October 17th will attest to. Anyhow, as with all good projects, I thought it was time to compile a little Report Card for your comment and review so without further ado, here are a few key stats to start us off. I baked on 10 occasions. Double figures – yeah baby – well done me! And that’s just for the new recipes (although admittedly while I cooked quite a bit, there wasn’t much ‘baking’ outside this list). I made 6 new recipes. I used lots of ingredients. More than is probably good for me (and others). But what a blessing it turned out to be! Most successful – Apple & Raspberry Squares – by a mile! Amazing what some slightly squished raspberries from the market and a crinkly old apple can produce. I had people visiting my desk to tell me how good this was and one guy wanted to schedule my next ‘cake’ day in his Outlook calendar as he had missed out on my little squares of fruity joy second time round. This has sinced morphed into Raspberry and Coconut Cake with as much success. I made this 3 times and may even morph this further as the blackberries are coming into season along my walk home. I LOVE Hot Cross Buns – warm and lovely with lashings of butter. But since moving to the UK, I have not been able to partake of this little Easter treat as I am allergic to oranges and there is mixed peel in every one of the little blighters. In the face of significant incentive for mastering this one, there was also a less-than-successful bread-making incident in Home Ec. at High School so I embarked on this one more than a little daunted by that living (breathing?) entity – yeast. Having mastered yeast-o-phobia also meant that Walnut & Rosemary Bread was a cinch – twice! I have to confess that I’ve never been a huge fan of these myself so when these came out of the oven looking like little crunchy lumps of…well not biscuits, I nearly didn’t take them to work. But they disappeared and people made [polite] yummy noises, so not disasterous by any stretch of the imagination. Note to self: only bake what moi likes to eat. The plan for office birthday baking was to educate everyone with a couple of Aussie icons. I managed the Anzac biscuits with ingredients from the store cupboard (although why I had rolled oats in there I will never know) and they were meant to be accompanied by Lamingtons. Having been inspired last November by A-down-the-hill’s Lamington exploits, I was so looking forward to this but time/energy/enthusiasm faded slowly away last weekend and I ended up whipping up a batch of the Raspberry and Coconut Cake using ingredients I already had. Despite the absence of lamingtons in my portfolio, it does make me rather proud to say I ‘whipped up’ a cake. So there you have it folks. My Year of Baking. And there are still items of the pastry, chocolate, mousse, jelly and iced variety to explore as we cruise on-board the SS 42. Now where did I put that spatula? 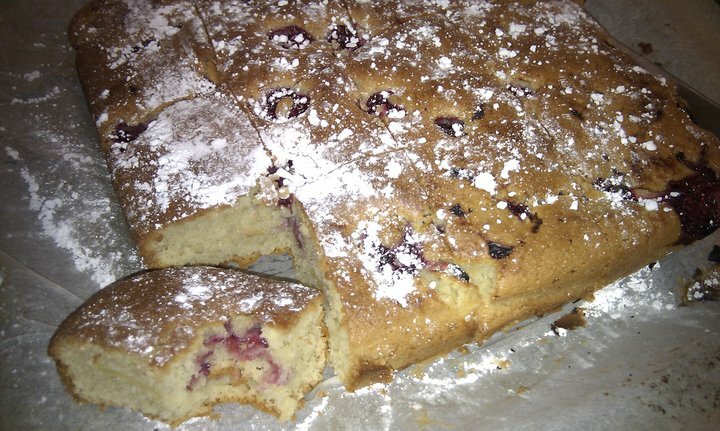 This entry was posted in Expat moments and tagged blackberries, cake, hot cross buns, lamingtons, The Great Bake-Off by Kym Hamer. Bookmark the permalink. Thanks Jane. There's part of me that can't wait to bake the next new thing. But the other part wants to play with my new birthday toy – a Kindle! Decisions, decisions…. I should watch out for that guy – sounds a bit spooky to me! Great recipes, my mouth's watering, oh lord can't resist, have to head for the cookie cupboard. Oh and congratulations you – birthdays and baking, a wonderful combination! Thanks Linda…I feel it's important to extend the celebratory atmosphere for as loooong as possible! Belated Happy 42nd and Congratulations on a successful Baking Year! Gidday HQ clearly is in full celebratory fashion this August. Love that the guy at work wanted to electronically 'pencil you in'!